This ant earned its name because of their pungent “rotten coconut-like” odor when crushed. Odorous house ants can be found in the nest of larger ants. They can be in exposed soil, but are most often under objects on soil, including materials and equipment stored outdoors. They tend to move their nests in response to rain or changes in seasonal temperatures. They enter buildings when their food supply is limited, such as during rainy weather or with leaf fall in autumn. 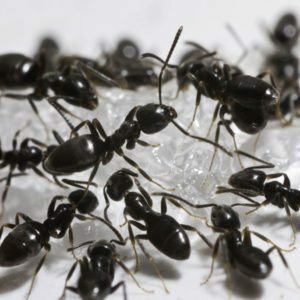 When inside, these ants build their nests near a moisture source, such as in wall voids, especially around water pipes, sinks, water fountains, beneath commodes with leaking seals, etc. Prefer sweets, but will also eat foods high in protein and grease, such as meat and cheese. Developmental time (egg to adult) is 34-83 days, varying with temperature during summer months, and up to six to seven months during the winter. First swarmers appear from May to mid-July. Control of odorous house ants is often not simple and usually requires finding the nest, treating the nest, treating using different materials inside the structure, baiting and/or some perimeter treatments, plus some environmental cleanup. They are especially difficult to control because there are so many queens in a nest.